So at last I finally have managed to get around to working on and completing this entry. This is going to be a large one, revolving around a new work released through Scarlet Imprint, known as Apocalyptic Witchcraft. Written by Peter Grey, I believe that this book is another important milestone within the world of Occult Publishing and Witchcraft in general. For those who are already on the fence and have some inkling as to what this book relates to, my whole recommendation and this post can be summarised quickly and simply: it’s an important work, if you are the least bit interested, order a copy at the next available opportunity. For those who have yet to be introduced to this work, and know very little about Scarlet Imprint, hopefully this will be an informative post. Founded in 2007, Scarlet Imprint was originally created in order for Peter Grey to self publish his work, The Red Goddess. Since then, alongside several other Occult publishers, Scarlet Imprint has gone on to contribute massively to the growth of the Occult publishing scene releasing many works by a diverse range of authors. These works cover a large section of differing paths, and alongside Ixaxaar, has become for me one of my primary sources for new texts. 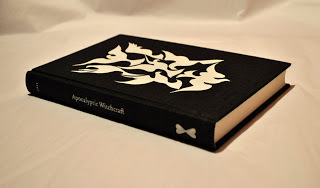 Upon seeing that Peter Grey was releasing a new book authored entirely by himself, and having not had the pleasure of yet reading The Red Goddess, I made it a mission of my mine to acquire a copy of Apocalyptic Witchcraft. 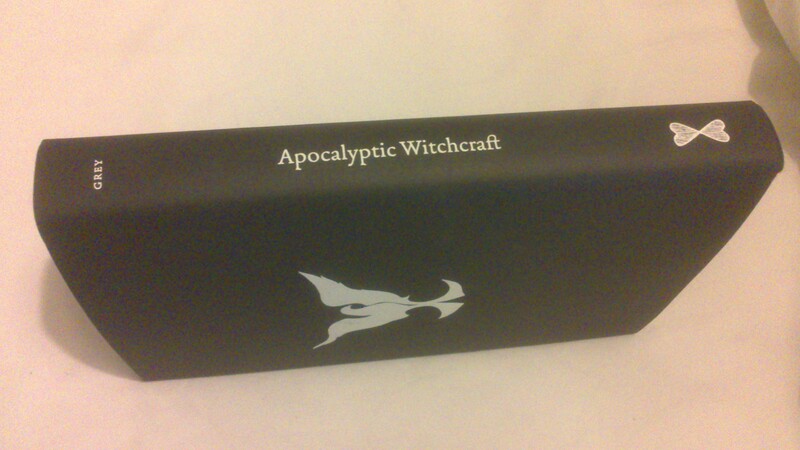 The edition I went for was the standard hardback edition – my usual compromise between quality and cost when it comes to purchasing Occult books. Called the Of The Doves edition, this book as described on the site, is an octavo book of 200pp, that has been bound in rough black linen cloth. A picture of both the side version and my own can be seen below. 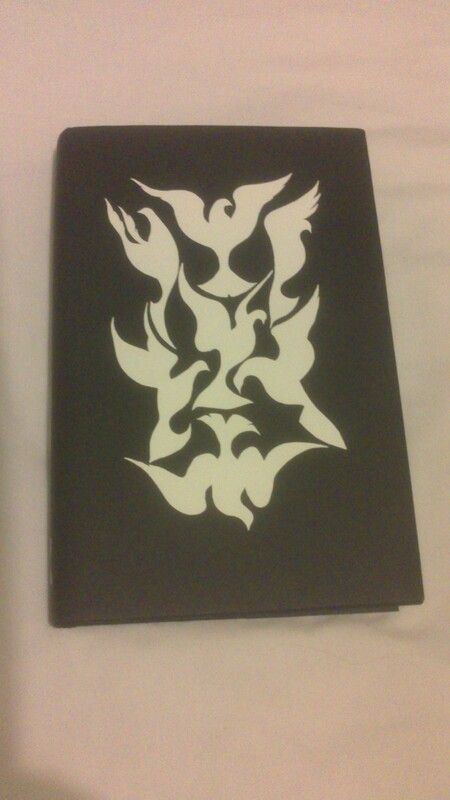 Picture from the Scarlet Imprint Website showing the Of The Doves edition. From first glance, the book looks very striking both inside and outside of its dust jacket. As the website states, the Doves are a symbol that is highly important within the work itself and the meaning of them is brought forward in the text. Although not in the same league as the talismanic and consecrated magical books I own, it does seem to still to exude a power of its own that really does invite it to be read, and understood. As with all other Scarlet Imprint books I own, I can therefore say it appears to me to be of high quality in its construction. The paper used feels thick and good quality, and appears to be well bound as well. It feels weighty, and robust, and like it could survive in my often perused collection for quite some time. Several images of the exterior and interior follow. Unfortunately, all I have got to really take images is my phone camera, and the results vary widely. I have trouble getting it to focus sometimes even with setting changes. Hopefully these will be sufficient to illustrate the above point. Exterior shot of book in it’s dust cover. 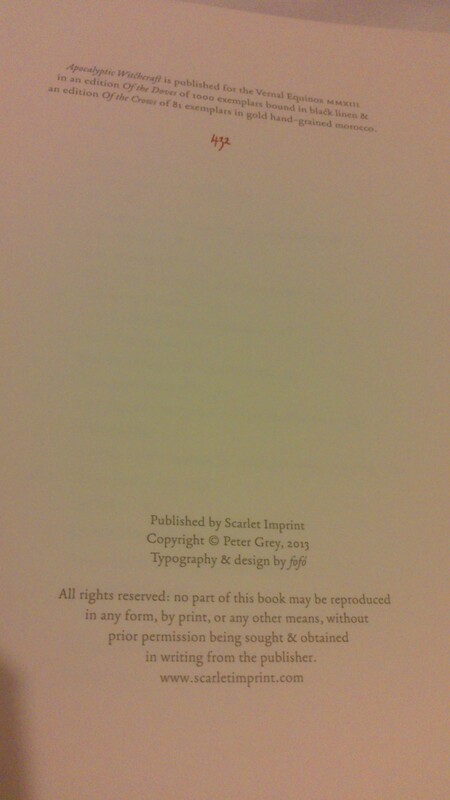 Shot of the interior of the book, displaying the title page and the end papers. A shot showing the rear and spine of the book. With the pictures of the exterior and interior out the way, I wish to move onto the contents of the book itself. Here I intend to summarise each section and also add what I took from each part of the book. Firstly, the book opens with a small prefacing chapter called Exordium. An Exordium is a a beginning or introductory part, especially of a speech or treatise, designed to put the reader in a favourable state of mind before reading the main text. The Exordium in Apocalyptic Witchcraft does this excellently, and summarising it here will I think give the reader a good overall impression of its content and what the author is trying to cover/convey. 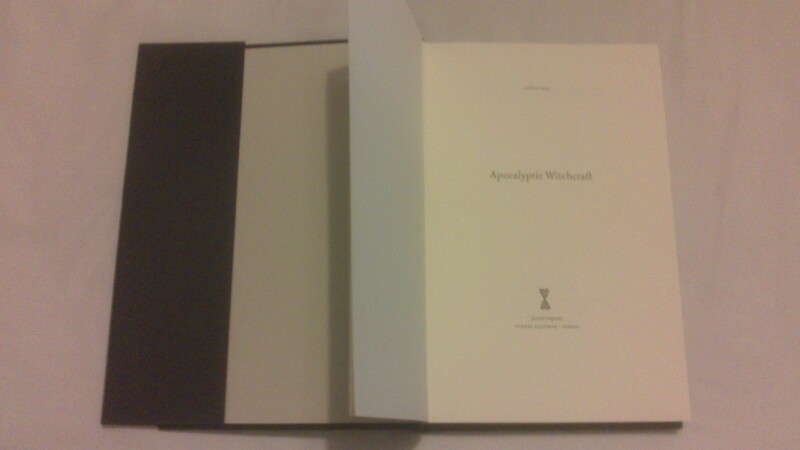 Interior shot showing the hand numbering of my copy. The Exordium opens with a clear statement declaring the books radical approach. From its own pages, it loudly declares that it ‘is a book which dares to prophesy’ and that it ‘is a perilous book, and one which does not aim to please’. It also states that its goal is to presents a view on ‘witchcraft for those who know that the wheel of the year has broken from the spokes of the seasons’. The Exordium tempers this stark opening two paragraphs with the following, ‘It does not ask for belief, adherence or followers. …. it simply asks that you listen’. This section is followed up by a clear and precise mission statement. In the authors own words, ‘This is a naked proposition put before you; to read again meaning to all these things [witchcraft]. To ask, what is it that underlies the pattern of our magic? What is the essence of Witchcraft itself?’. With the mission and feel of the book made aware to the reader, the author then goes on to describe the language the book will use to describe its concepts. ‘Neither is this an easy book, though the ideas are simply enough, and they need to be expression in the language of magic, as poetry ….. If i have taken liberties with ideas, then the mistakes are mine. If my writing is more ragged on the wing that writers who precede me, I answer that it can still fly. If this work is needful of more time, I confess it is a luxury none of us possess. My wish is that readers find new avenues of inspiration from these sources and enrich their practice with them. Time is of the essence now’. The Exordium does a great job of introducing us to the topic the author wants to break open and display the guts of – that Witchcraft and Paganism must grow into something new and radical, with a renewed spirit, to become something that is highly relevent for the modern, apocalyptic age in which we live within. Peter Greys passion and use of imagery to bring a point home is illustrated in this section before we even get to the main text, and begin consuming the main body of his work. The entire book is written in a poetic like prose that helps to convey the meaning far better than dry text. Interspersed between the chapters, poems like these help reinforce each prose section and help one chapter blend well into the next. With the Exordium over with the book launches into the meat of the topics at hand in the following chapters. There are 10 chapters in total, each covering a specific topic. These build one from the other, and as the author states in the Exordium, are best followed in order to be fully understood. With the chapters listed, I’ll now try and attempt to summarise them in a basic form along with comments. In this opening chapter, the author launches into full flow. In this chapter, the groundwork foundations fo the entire book is lain. The author points out several important points in this chapter, that run throught he rest of the work. For example, he describes in poetic fashion the force of Babalon, and goes on to point out how Witchcraft is rooted in in the land, and the web of life. He goes onto further elaborate the reason for the books antagonistic tone – that he is opposed to how witchcraft is seen and used as an excuse to retreat into seclusion within the practioners own mind. Following on from the beginning of the chapter, he asserts that witchcraft is rooted in the the world as it is, and as radical changes cascade through our world, our traditions must by necessity also change. He goes on to point out that in witchcraft and paganism is not only tradition, but by necessity innovation, becoming and necessary revolution. From this, he argues that due to Witchcraft being a tradition of renewal, coupled with the dying age in which we live, by necessity it must rise to confront the new challenges presented to it and take on new, renewed form. 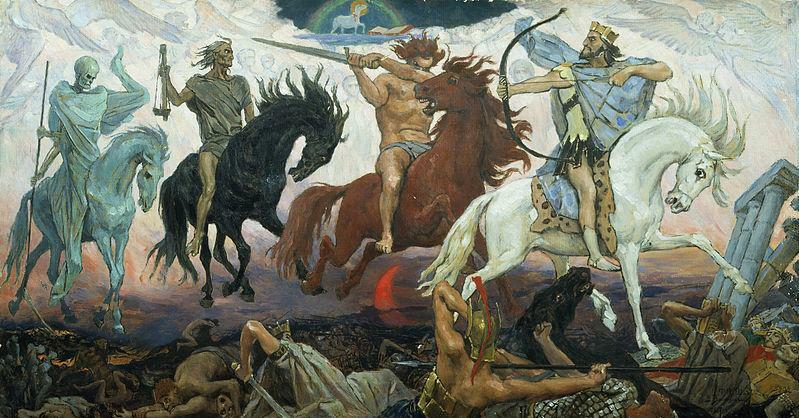 As the author says quite poetically, ‘ World’s end is not a threat from the pulpit, we have assembled it with dextrous and sinistrous fingers, bunkered our oblivion for the days of the final division of plunder now at hand. We will not follow the smoke to the stars until we are burned on the pyre of the earth. Love is the war to end all wars, and the war is upon us’. This section really hammers this point home. That through breaking from nature, all humankind, including ourselves, are complicit in the conditions which assail our environment and the real physical world in modern times. This is an important point the author makes. Not only is it the big multinational corporations, corrupt governments, and greed driven cultures but also each individual that wittingly or unwittingly, has contributed to the problem. From this position, the author goes on to define witchcraft how he sees it. He paints a unified, undiluted picture devoid of any attachment to a particular form, holding back from ascribing to his arguements any sense of orthodoxy. ‘You will find witchcraft at the end of a pointed finger…. To prettify witchcraft is as ill-judged as to disfigure it. You cannot deny the Goddess in any form of cast lantern light or play of shadows. You cannot say white witchcraft or black witchcraft without doing violence to Her complete being. It is time we heal this wound. Consider the words of the Thunder Perfect Mind: I am the Whore and the Holy One’. He then asks the question as to why modern paganism and witchcraft has thus far been insufficient to deal with the problems facing us and confront our enemies. He goes on to identify ‘modern’ paganism as witchcraft as beginning primarily as a compromise with the repeal of the witchcraft laws, and the careful experimentation that arose from this. He argues that current teachings that hold witchcraft to be practiced in a harmless or watered down fashion need forgetting, and instead a more proactive way forward should be sought. In his own words, ‘ I say that the power of the witch is in having every option open. Witchcraft will not lie beneath, will not be disarmed… Witchcraft, and by that I mean malefica, is the strong face we should show to this world. This is a merciless path…. [Example of the the solonaceae is given] enable us to fight poison with poison. There is no way to separate the powers, and no way we should be cleaved from our rights to exercise either’. He then goes on to caution however, against infighting within the Pagan and Witch community. He wants against horizontal hostility between people who fundamentally, hold similar values and belief systems no matter their mythic underpinning. He stresses this is additionally important in an age where a united witchcraft and paganism on some level will be necessary to survive, and that instead, Witchcraft and Pagansim should collective grow and adapt into a force for change and effectiveness. As an opening chapter, I feel this does a good job of introducing the reader to the text, as long as its followed in a logical manner. ‘It’s all blood and roses from here on in. As witches, we should prepare to fly on the wings of the storm’. This chapter is the shortest of the entire book, however arguably the most important for the author to lay bare his intentions, motives, and views. This is done in bullet point form, the author specifically deciding to cover thirty three points. The author keeps these succinct, and they help illustrate and clarify the points the author first covers in the Exordium and First Chapter. Several extracts follow that I hope illustrate this. ’16: There is one Witchcraft under many names. There is one Grand Sabbat on One Mountain. ’33: Witchcraft is present, it is ensanguined and vivified. Witchcraft is prescient, it gazes on the future. This section ends thus quite powerfully, after having delivered to the reader the undiluted essence of the books message. Its effect is amplified, coming after the first chapter, and is thus well framed by it and sets the reader up for the following chapters. Arguably the chapter with the potential to be the most confusing of the book, She is Without is dedicated to the author and his partners visit to the Cave of the Apocalypse, where John was said to have received his visions which would later go on to become the Revelation of the Bible. It is written in a dreamlike, poetic fashion, which really captures the thought processes of the author in his search for understanding on the Isle of Patmos. Although short, the chapter is powerful and can be difficult to follow and interpret, especially on first reading. However, as we will see, it is closely paired with the next, and sets it up in a profound way to deliver an important message, a method which the author uses throughout the text. This chapter was particularly important to me and resonated, due to my own dream experiences I have related in the about section and intend to do a post on at some time or another. I could identify with the healing dream, and see the experience reflected in his writing of another that had undergone a similar experience, and was startled to see it reflected in this section. This chapter is essential reading, and really helps make sense of the preceding one. On this note, I’d like to end the first post. This is in the main due to its length, I’d love to be able to cut it down as promised into two more readable parts. Hopefully this has been a good first half and has sufficed as a good introduction to the book and its contents so far. In the next section, I will continue summarising the chapters to the best of my ability and commenting on them. These chapters delve much deeper into the what the author believes is the underpinning of witchcraft and pagan belief, and how it can be channelled. I will then finish up with a conclusion and a final verdict. This entry was posted on September 19, 2013 at 2:08 am and is filed under Occultism, Paganism, Traditional Witchcraft with tags Author, Doves, Dust jacket, Peter Grey, Publishing, Reading (process), Scarlet Imprint, Witchcraft. You can follow any responses to this entry through the RSS 2.0 feed. You can leave a response, or trackback from your own site.